The Rainbow world of Hue. To tell a computer what colour to set a pixel to, RGB values are used to make life easy for the display units which are made using Red, Green and Blue dots. Colors.h contains methods to pick colours from the spectrum using a number between 0 and 1; to change the brightness of a given colour, to blend and Alphablend colours. In the image, the (horizontal) range is called 'Ratio' and shown the cosine curves and spectrum. 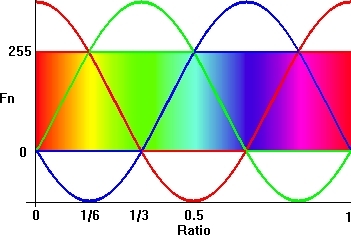 The vertical scale is intensity of each of the RGB elements and is labelled 'Fn'. Imagine that you have a number of things that all need to be different colours. A GetRainbowColour(Ratio) function that lets you allocate a colour to each thing would be valuable. If you have a hundred lines, what colour is line fifty? The Ratio would be 100/50.0 which is 0.5 (cyan). So Ratio = LineCount / LineIndex (but make sure you're not doing an integer divide)! So now you see why the methods were called Ratio and Fn: The Ratio depends on how many things you want to colour, and Fn is short for ... 'Function'! 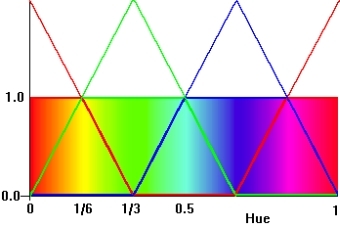 Fn is the intensity for each component of the RGB. So given a Ratio, find: RGB(Fn(Ratio), Fn(Ratio + 2.0/3.0), Fn(Ratio + 1.0/3.0)) Since cosines are periodic, it doesn't matter that Ratio has been added to. Imagine pushing the peak of the green wave to the right until it is over the red peak - you have to push from Ratio=1/3 to Ratio=1 which is a push of 2/3. In other words, for a Ratio of 1/3, Fn should be maximum for Green. But Fn works for Red, so add 2/3 and you have a Ratio of 1 which will return the maximum required. The range of Ratio is from 0 to 1, but Cos takes values from 0 to 2*PI, so multiply Ratio by 2*PI before using Cos. Cos gives an answer between -1 and +1. Since the cosine of a third of a circle is +0.5, the cosine curves intersect at -0.5 to +0.5. Now, to clip the result of the cos to -0.5 to +0.5 and scale to get the result to be between 0 and 255. First add 0.5 to the Cos result giving a range of -0.5 to 1.5. Multiply by 255 to get the range [0,1] and all that is left is the clipping. This code is simply splitting the Ratio into six parts and returning a rising straight line for the first sixth, a falling stright line for the fourth sixth giving the shape of the Green line. The calling 'GetRainbowColour' function now displaces the Red and Blue values by adding and subtracting a third from the Ratio. Since Ratio can come into Fn outside of the 0.0-1.0 range, the first two lines of Fn pull Ratio into range. This is a very fast way to pick colours from the spectrum, but there is always room for optimisation!